Whether you homeschool or your kids are in public or private school, you’ve probably found yourself wishing you could afford a private tutor at one point or another. You can’t be an expert in everything, but the cost per hour most tutors charge … yikes! And if you’re a homeschooler, tutors may be busy during the day (in their day job) when you need them most. 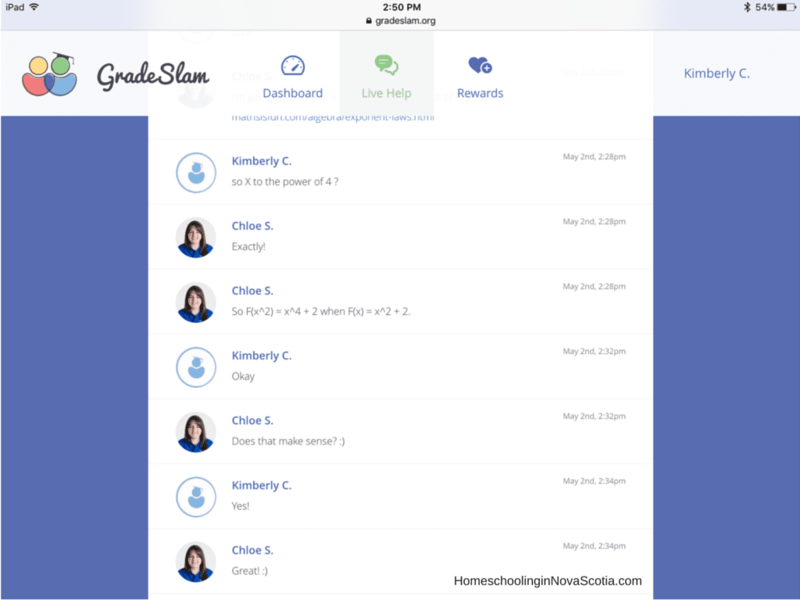 I’m happy to share that there’s a solution – an affordable online tutor for middle school through college, available 7 days a week, 24 hours a day, GradeSlam! Then your child and the tutor can type back and forth about what they’re working on, whether it’s a paper, a concept, or a specific question. (I recommend registering under your child’s name instead of your name though, as the tutors kept calling my kids Kimberly *grin*). 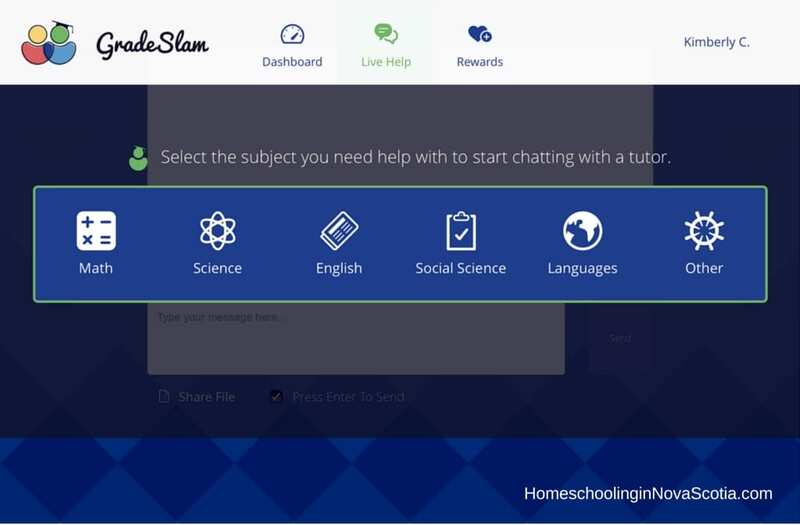 I found GradeSlam especially useful because I work from home full time and don’t have the time to painstakingly go over concepts when it isn’t my strength – science and math for instance. GradeSlam can be so valuable for giving your students help in your weak subjects, or when you just don’t have large chunks of time to devote to their weak subject. My only criticism of GradeSlam is that for math they could benefit by a whiteboard. Hopefully they will provide one in future so they don’t have to express exponents in potentially confusing ways. If you have a child in middle school, high school, or college, you need to give this affordable online tutor a try. It would make a fantastic gift for your child starting college or university this fall! They provide tutoring in all subjects, even many foreign languages. 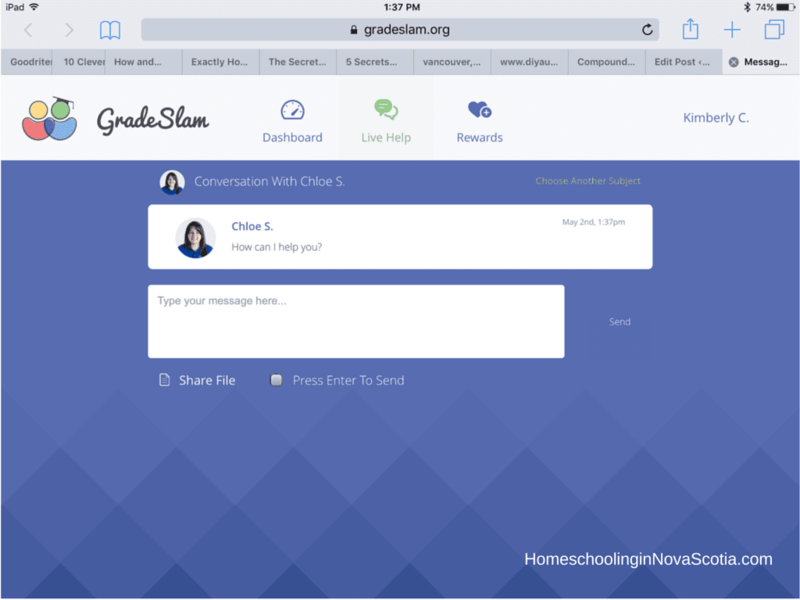 Educents has two amazing GradeSlam specials to choose from! 3 Months of Unlimited 24/7 Online Tutoring (all subjects) for only $20 US. That’s less than half price! One Full Year of Unlimited 24/7 Online Tutoring (all subjects) for only $99 US. Save $81! Educents offers a number of different tutor options for you to explore. Check out Expert Online Tutor for college tutoring or Tutor Doctor for one-on-one tutoring for children and adults. If it’s times tables your child is struggling with, we LOVE Times Tales for learning them in a fun, easy way in our homeschool. Please note: This review contains affiliate links. If you click through and buy I make a few pennies to keep up Homeschooling in Nova Scotia. Thank you for your support! This review was sponsored by Educents in exchange for an honest review. All opinions are my own. 101 Easy Homemade Products Book Review AND Giveaway! I love making my own cleaning products and have been doing so for years. They save me money and are made from natural ingredients. I jumped at the chance to get a copy of the new book, 101 Easy Homemade Products for Your Skin, Health & Home: A Nerdy Farm Wife’s All-Natural DIY Projects Using Commonly Found Herbs, Flowers & Other Plants. 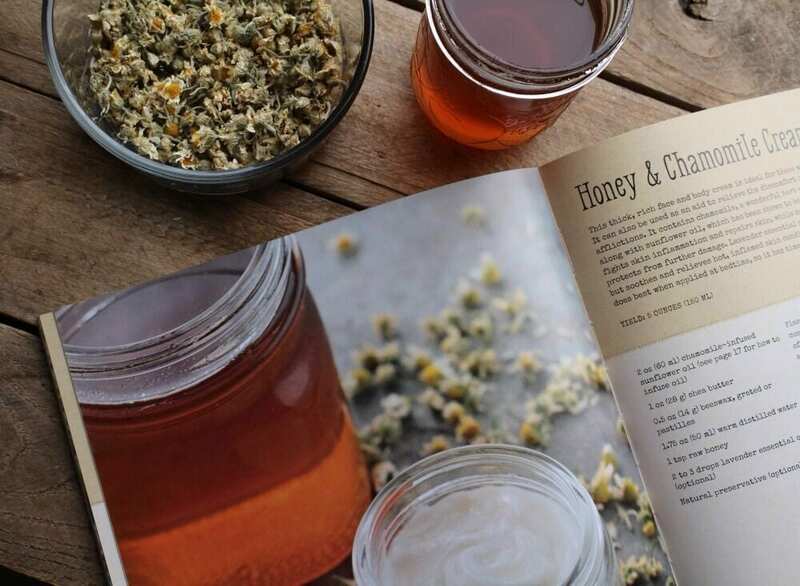 This book doesn’t just include 101 recipes for easy homemade products for your body and home. It begins with an excellent primer on the healing properties of various plants (many found right in your yard). Learn how to preserve herbs and plants, and three different ways to infuse oils. Learn all about oils and butters and their individual shelf lives. I live on an island, so I really appreciate the substitution list. We use medicine as a last resort in our home, preferring the preventive medicine of healthy living. I’ve been wanting to get into homemade remedies more, to have an alternative when we do get sick and I have attended a little workshop in the past, but I lost my notes and never tried making anything myself. I’m so excited to have this handy reference that I can turn to now anytime I want. Besides the ingredients, what do you need to make these recipes? Items you probably already have on hand! A hand mixer, mortar and pestle or electric coffee grinder, mesh strainers, and canning jars. Even I have these items in my kitchen. It’s also helpful if you have a digital scale for accuracy, a double boiler, and a small food processor, but they’re not absolutely necessary. I haven’t had a chance to make any of the recipes yet, because the ones I really want to try require spring weather. It’s still cold with nothing green to be seen, not even tulips poking out of the ground yet, and certainly no roses or dandelions. I’ve read through all the instructions though and they are thorough, step by step, and easy to understand. I’ll be sure to share with you when I start making some. So what kinds of recipes are in the book? A wide range, including skin care, salves and balms, lotions, creams, bath soaks, salts, melts and scrubs, soaps, home remedies, cleaners (yay! ), and even pet care! I’m looking forward to dandelions appearing on my lawn now! 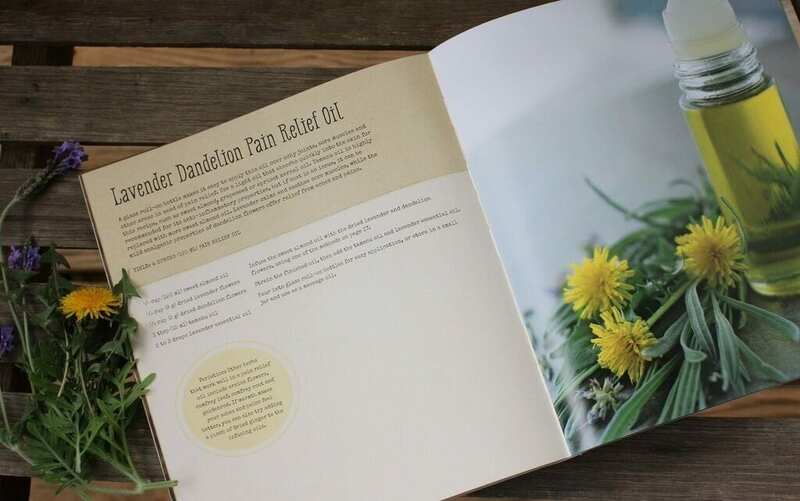 Then I can make this Lavender Dandelion Pain Relief Oil. I’m also looking forward to giving this Honey & Chamomile Cream a try. I can see a lot of mother-daughter pampering sessions in my future with these delightful, easy homemade skin care products. I just have to mention the high quality of this book. The texture of the cover is amazing and the pages are beautiful and glossy (if you are tactile like me you won’t want to put it down)! The pages are sewn so they lie completely flat and the book is very sturdy. I will be handing this down to my kids someday. 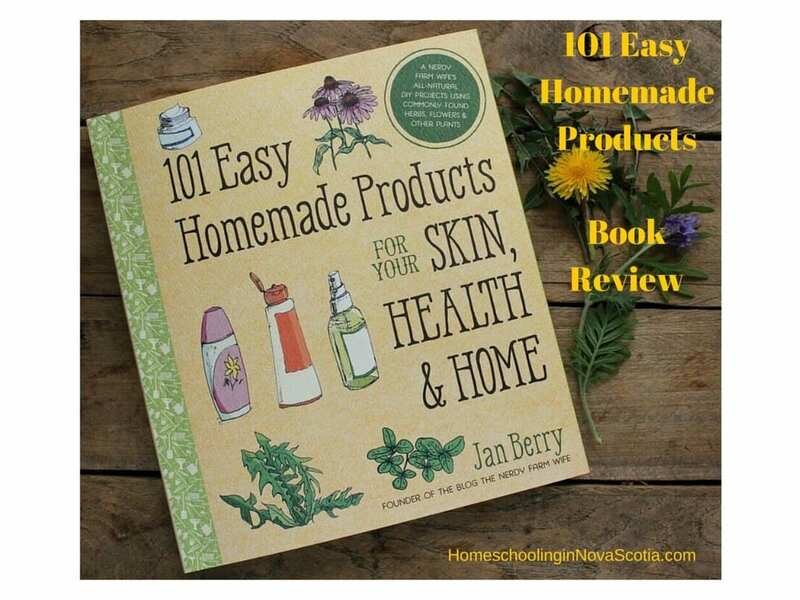 The author of 101 Easy Homemade Products for Your Skin, Health & Home, Jan Berry, is owner The Nerdy Farm Wife blog, where she shares creative ways to turn herbs, flowers and other garden plants into pretty, fun, and practical things. Her amazing projects have been featured on Natural Living Mama, BuzzFeed, Money Saving Mom, and more. She lives on a farm in the Blue Ridge Mountains of Virginia with her husband and two children. The 101 Easy Homemade Products for Your Skin, Health & Home paperback book is available on Amazon.com for $14.87US and on Amazon.ca for $28.43 CDN. Now the fun part … 7 paperback copies will be given away worldwide! Enter the Rafflecopter giveaway, below. Giveaway ends Saturday, April 2, 2016, 12:00 pm EST. Good luck! This giveaway is in no way endorsed, affiliated, or associated with Facebook, Twitter or any other Social Media Networking Site. This Giveaway is valid World Wide and Entrants must be 18+ years of age to enter. This giveaway event will end at 11:59 PM (EST) 4/2/16. The winners will have 48 hours to email their information back to thaleia.maher at gmail dot com or a new winner will be drawn, you may want to put this email address as safe as it could go to spam. The publishing company and author are each responsible for shipping of the above prizes. No blog associated with this contest are responsible for prize fulfillment. If you would like to be a sponsor in a giveaway or hold a virtual launch like this please email Thaleia Maher at thaleia.maher at gmail dot com. Disclaimer: The information in 101 Easy Homemade Products for Your Skin, Health & Home: A Nerdy Farm Wife’s All-Natural DIY Projects Using Commonly Found Herbs, Flowers & Other Plants is provided for informational purposes only. It is not intended to be substituted for the advice provided by your doctor or other health care professional. If you rely upon any programs or techniques, or use any of the products and services made available by or through the use of the book or the website for decision making, without obtaining the advice of a physician or other health care professional, you do so at your own risk. I was provided a copy of this book in exchange for my honest review. All opinions are my own. The Bible admonishes us repeatedly to be slow to anger. But when it comes to our kids, it’s surprisingly easy for us to be quick to anger! We know it doesn’t work. The definition of crazy is to do something over and over again even if it isn’t working, so why do we repeatedly get angry and stressed out parenting our kids? Here’s a book that can help! 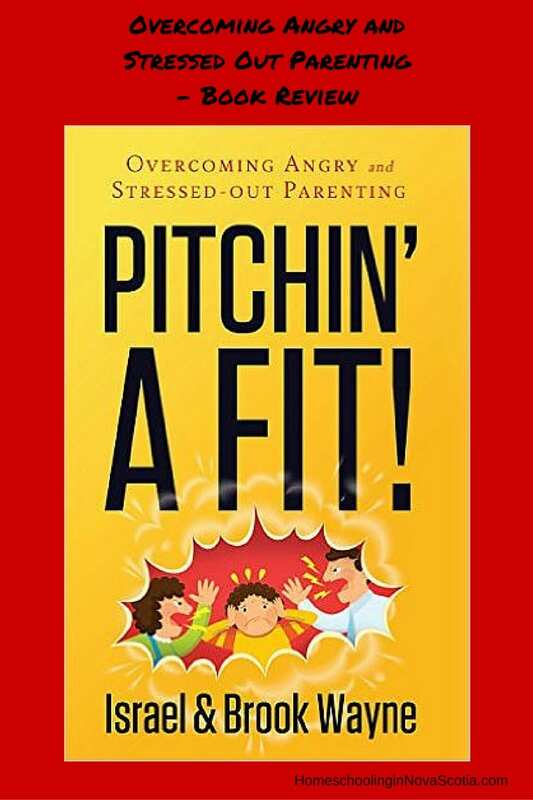 Israel and Brook Wayne have written a newly released book, Pitchin’ A Fit! Overcoming Angry and Stressed Out Parenting. Peppered throughout with scripture, the first third of the book contains Biblical discussions on the nature of anger, exploring if anger can ever be Godly, and how prayer and dwelling on God’s word can keep us from anger. Then it delves into causes of parenting stress and anger, and what we can do about it. At the end of many of the chapters are thoughtful “Questions to Consider” to help us mull over and work through the contents. The Waynes point out that yelling trains your child to listen only when you’re angry! That’s so true! And they give great steps to break the yelling habit. I’ve been trying one of them lately – catching myself and speaking quietly instead of yelling. I love that they advise apologizing to your kids when you lose your cool. I’m a firm believer of admitting to your kids when you’re wrong. 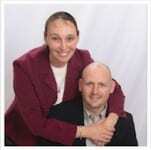 The authors, Israel and Brook Wayne, are a husband and wife who homeschool, just like you. They have nine children, so I’m sure they know all about being angry and stressed out with their kids! Israel is also the author of Homeschooling from a Biblical Worldview, Full-Time Parenting: A Guide to Family-Based Discipleship, Questions God Asks and Questions Jesus Asks. Check out the Family Renewal website. And you can listen to an interview with authors Israel and Brook Wayne about their new book here. If you are a Christian parent with young children, you need this book! It will give you great food for thought for overcoming angry and stressed out parenting along with Biblical references for guidance. I was provided with a digital copy of this book in exchange for an honest review. All opinions are my own. Is one of your goals organizing your life and business this year? Mine is! It’s important for moms to be organized. 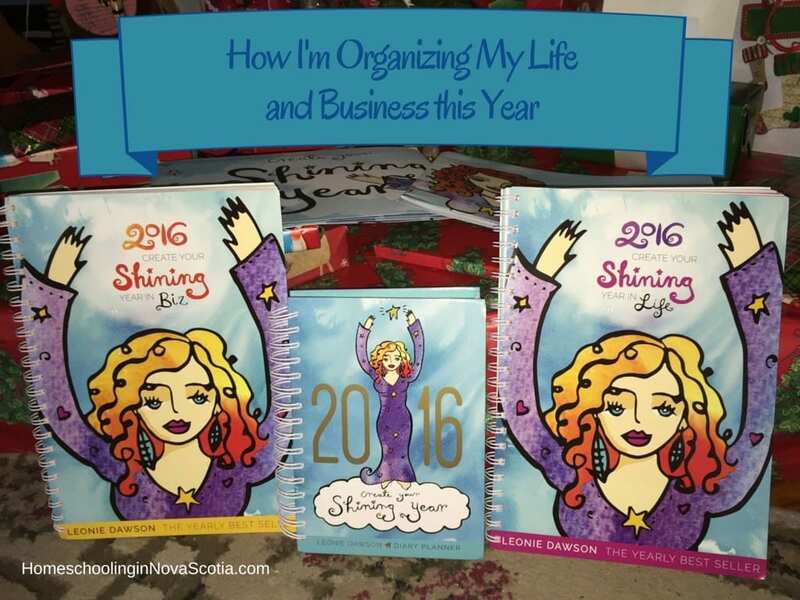 I just have to share how I’m enjoying getting organized with the help of Leonie Dawson’s Shining Life and Shining Biz workbooks. I love, love, love these books! This year is my first time experiencing the process of working through Leonie’s workbooks and I’m in love. Leonie’s beautiful doodles and artwork make me want to keep opening the books to work through them. These aren’t typical, boring workbooks. Check them out! Some pages even have black and white drawings so you can colour them in. It’s so soothing and satisfying for my inner, creative child to colour and write in these gorgeous, glossy books with colourful permanent markers. Sharpies don’t go through to the other side! But they’re not only fun, they’re also practical. I am finally getting things done with these books! I admit it, most of my days were spent frantically rushing from one urgent task to another in my business and home life, before using Leonie’s workbooks. Now I have goals and tasks that I’m sticking to. Even better, Leonie Dawson’s community is like a big hug and a kick in the pants at the same time. Leonie’s folk are energized and innovative and so much fun to hang out with in her Facebook group. I even found a group to help me work through The Artist’s Way with other Leonie Dawson fans. We started working through the book together in January. I’m loving it! 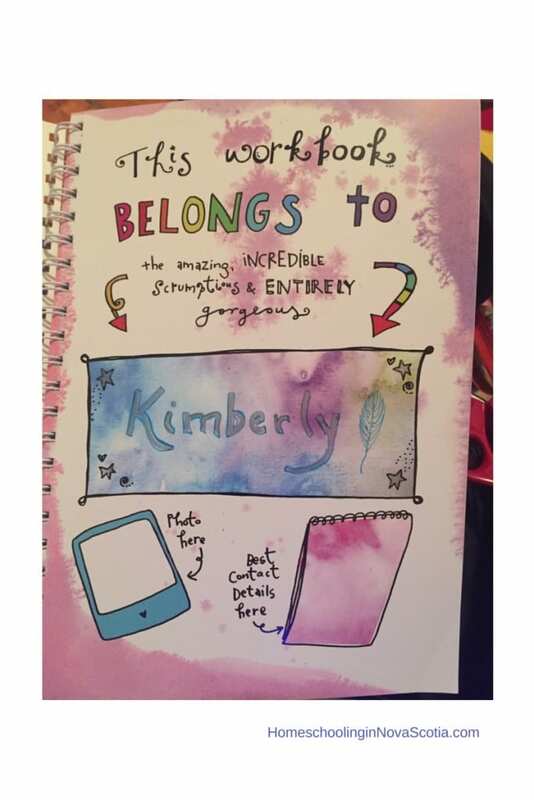 I’ve set goals for the first time in my life using the Life Workbook! I’m back to reading books for me this year – I didn’t finish reading a SINGLE BOOK in 2015 and I love reading! I’ve read every day so far this year and finished two books in January and February (my goal is to finish two each month). I’m also writing and exercising every day (hooray for the Wii Fit). And I’m getting my home decluttered, one room at a time. As Leonie says, those who write down their goals are more likely to get them done! One of the great little rituals I’ve developed from this book is writing down everyday miracles (things I’m thankful for each day). I cut out the label from the workbook and decorated a jar. 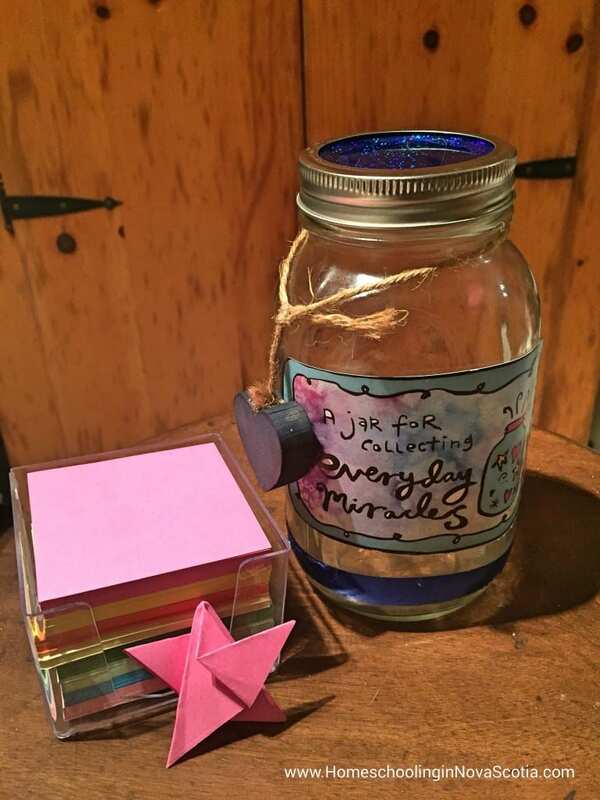 My daughter made an Everyday Miracles Jar too, and each night we add something we are thankful for. I work full time these days as a writer/editor from home. Working through the Biz workbook has already changed my life – I’ve made more time for things that matter and am reaching my daily goals. I’m focused instead of scattered. It’s a good feeling. If you’re starting up a business, you may have to leave some of the pages at the beginning blank, as they help you reflect on how your business went last year, but you can definitely benefit from it as much as an established business can. The physical copies of the books have already sold out in North America. But the good news is, you can still get the digital copies – no shipping fees and you can download them instantly. My Biz Bundle came with digital copies which I used to start working through the workbooks until the physical copies came in the mail. I used an app that allowed me to write in them with a stylus, so I got the feel of physically writing in the books. You can pick up the Life and Biz Workbook Bundle (digital version) for $17.95 U.S. or buy them individually for $9.95 U.S. Yes, it’s March (I’m sorry it took me so long to share these books with you!) but it’s not too late to get organized and set goals for the rest of your year! What do you use for organizing your life and business? 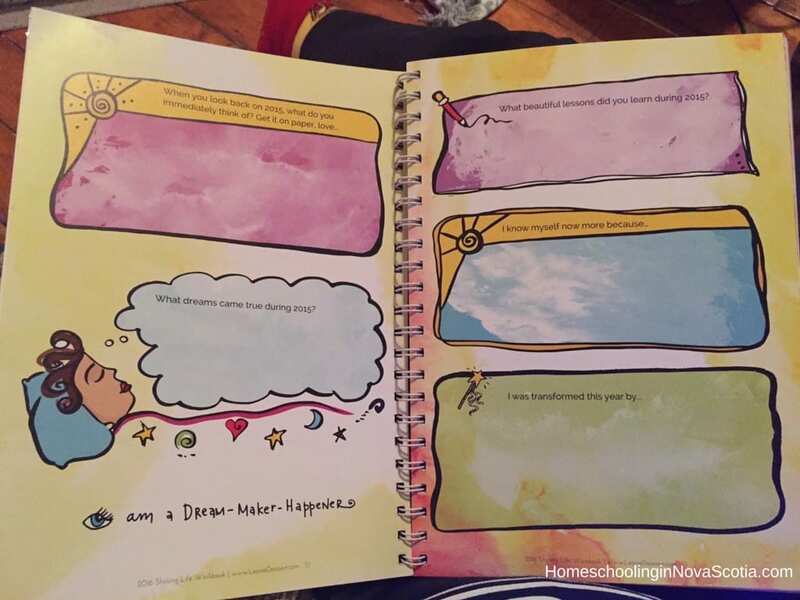 Do you use Leonie’s workbooks? Please let me know in the comments below! This review contains affiliate links. 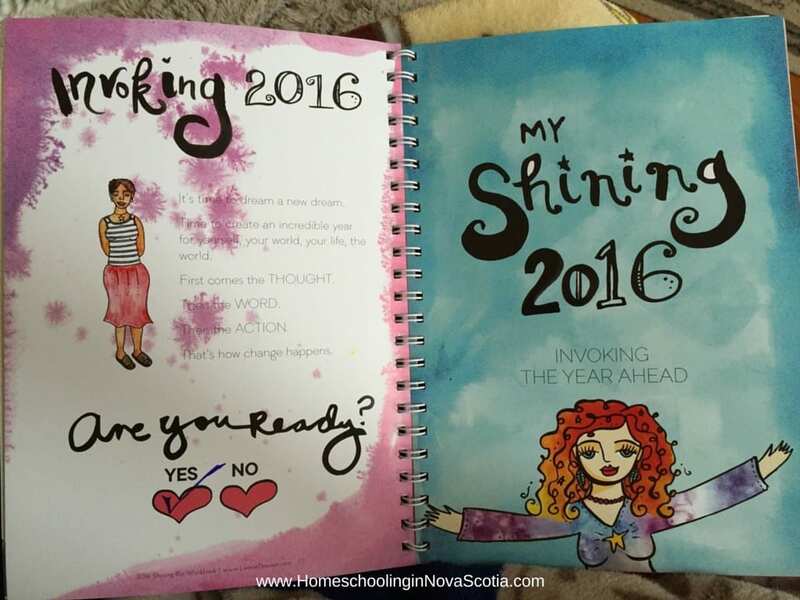 If you click through and buy, I make a few pennies to keep up Homeschooling in Nova Scotia. Thanks for your support! 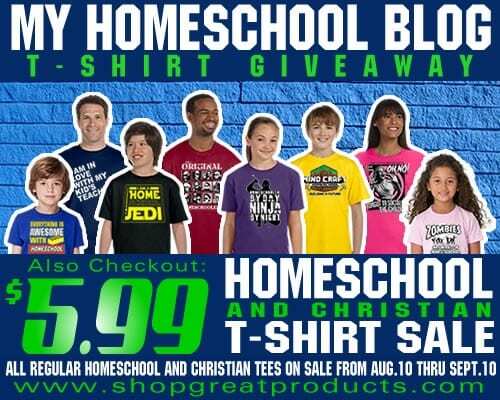 Homeschool T-Shirt Sale, Review AND Giveaway! I’ve always wanted a homeschool t-shirt of my own. If you’re like me (or you’d like some t-shirts for your family), check out my review and this great $5.99 t-shirt sale and then enter the giveaway below! Great Products has been making homeschool t-shirts since 1992. They offered me a t-shirt of my choice in exchange for an honest review. 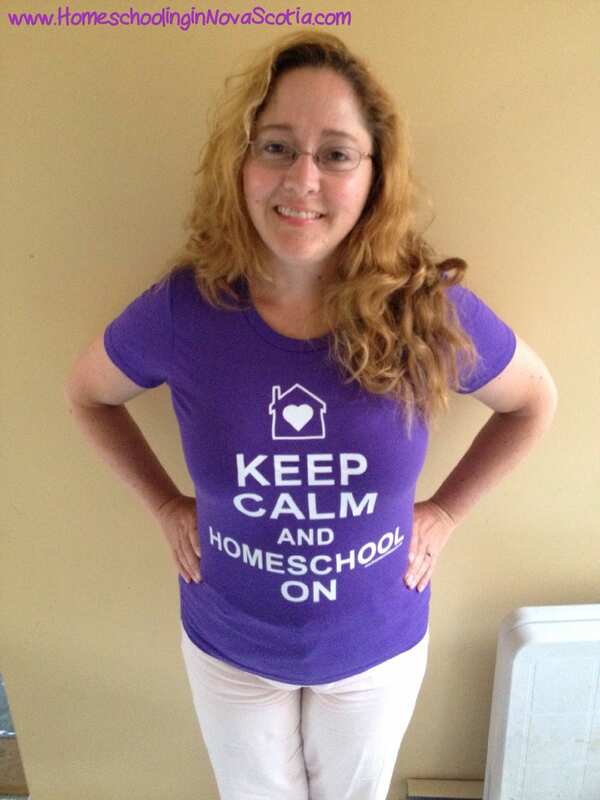 I chose the Keep Calm and Homeschool On design, in my favourite colour, purple (it’s even my favourite shade)! I chose a ladies fitted tee. I prefer them to the boxy tees, as I like having a shape, even as a homeschool mom 🙂 I’m wearing a size medium here and it fits to size (although if you like yours more roomy, I’d suggest going up a size). These ladies fitted tees are made of comfortable, 100% combed ring-spun cotton jersey. My t-shirt is so soft and comfy! I like the weight of the fabric as well – it’s not too thin (like some t-shirts you might purchase online). I also love that I can promote homeschooling, something I love to do, simply by wearing my shirt. Regularly priced at $12.99 US, this shirt is just $5.99 during the Great Products sale until September 10th! Once you’ve checked out your favourite t-shirts at the link above, enter my giveaway below! One of my readers will win a FREE homeschool t-shirt, with their choice of design, size, and colour! Pick one for yourself, like I did, or choose a t-shirt for one of your family members. Contest closes at 12:00am Atlantic Time on September 1st. Open to the U.S. and Canada only. Winner will be notified via email – if winner does not respond within 48 hours, another winner will be chosen. Good luck! Heather Kendall is an author who lives here in Canada. She is also a Bible Study leader, Sunday School teacher, and mother of three grown sons. I received her books, A Tale of Two Kingdoms and God’s Unfolding Story of Salvation, in exchange for an honest review. A Tale of Two Kingdoms is split up into two parts: Waiting For The Promised Seed and Responding to the Promised Seed. The promised seed, of course, is Jesus. Heather tells the story of the Bible – following God’s kingdom and Satan’s as the story unfolds. Peppered throughout, she shares her own stories and musings to illustrate. God’s Unfolding Story of Salvation is a good companion book. Follow along with A Tale of Two Kingdoms chapter by chapter, and God’s Unfolding Story of Salvation gives you scriptures to read and points to ponder. We have been reading A Tale of Two Kingdoms and God’s Unfolding Story of Salvation in our homeschool – mostly with my 14 year old, but sometimes we read aloud with my 9 year old as well. In fact, we have been incorporating chapters surrounding Christ’s birth into our nightly Advent celebration this month. While at times I do disagree with some of Heather’s take on scripture, it is good food for thought and is great for generating discussion with my teen. It would be ideal for a Bible study with older teens or adults. Learn more by watching the Youtube trailer for God’s Unfolding Story here. A Tale of Two Kingdoms and God’s Unfolding Story of Salvation are available for purchase on the Tale of Two Kingdoms website or on Amazon. A Tale of Two Kingdoms is $21 CDN or $23 US and God’s Unfolding Story is $20 CDN or $22 US. 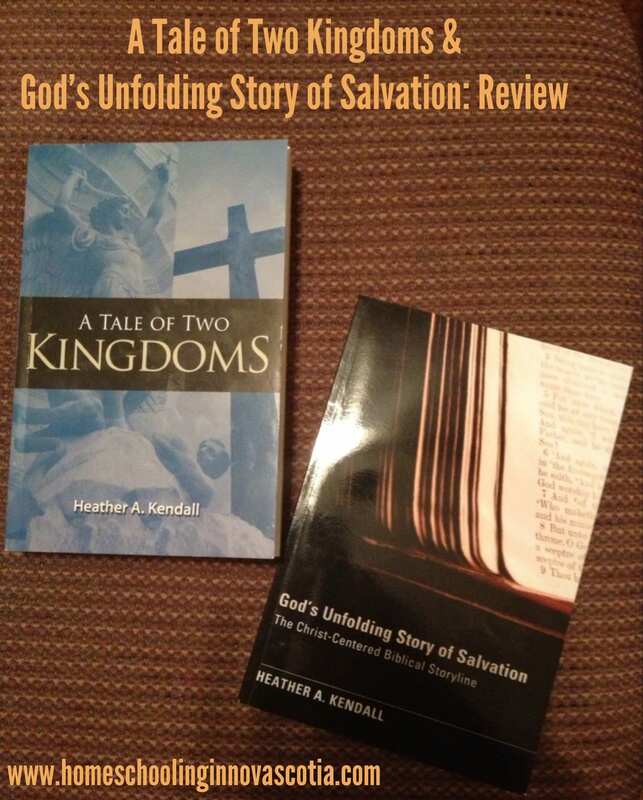 I received A Tale of Two Kingdoms and God’s Unfolding Story of Salvation in exchange for an honest review. All opinions are my own. Since 2011, See The Light has been teaching drawing skills with a Biblical perspective and teaching Bible stories through art. 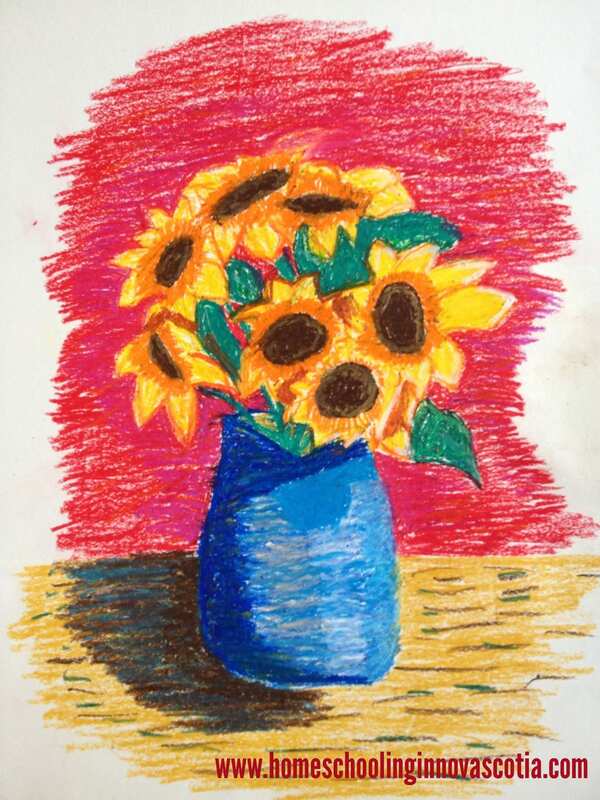 I received the Sunflowers (in the style of Vincent Van Gogh) Art Project DVD to work through with my 9 year old and 14 year old. 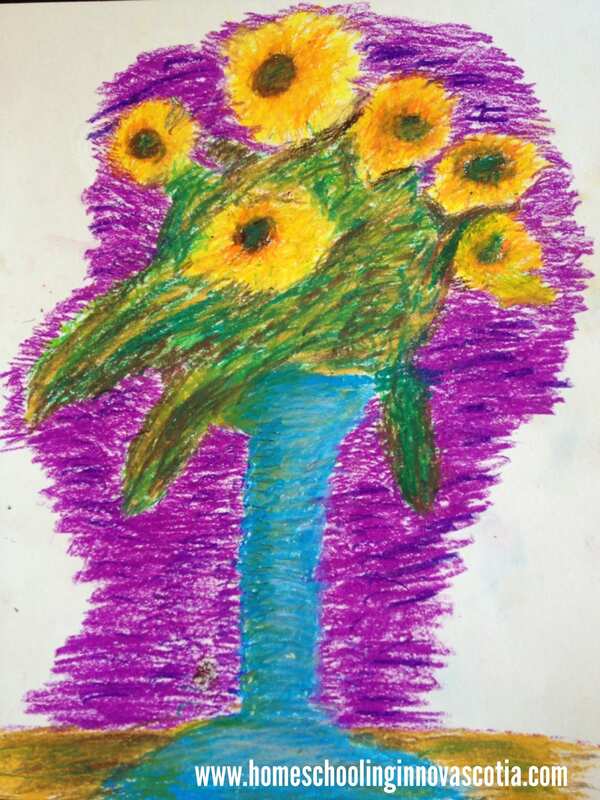 While watching the DVD and going through each lesson, my children learned so much about Vincent Van Gogh and post-Impressionism, and so did I! I had no idea that he almost became a clergyman instead of an artist, and that he did missionary work. And my daughter just loves to draw. Can you tell? The Art Project DVD series is designed for ages 10 and up. Use the 9 DVD set as a half-credit course for your high schooler, or use the suggested activities for enriching the course and making it a full credit with this High School Fine Arts Credit PDF. Learn more about the Art Projects DVDs at this link by watching the video at the top that says “click to learn more”. Click here to watch excerpts of the Tiffany Window DVD under “Videos” to see what Art Projects are like. You’ll find that artist Pat Knepley is both a skilled artist and a delightful, personable teacher. You can also Like and Follow See the Light on Facebook and Twitter, to access all sorts of great art ideas for your kids, daily. Each individual Art Project DVD is $14.99 US plus shipping. The shipping cost is reasonable even to Canada – the site gave me a cost of only $3 for shipping to Nova Scotia. You can also buy the full year, 9 DVD set for $99.99 US. 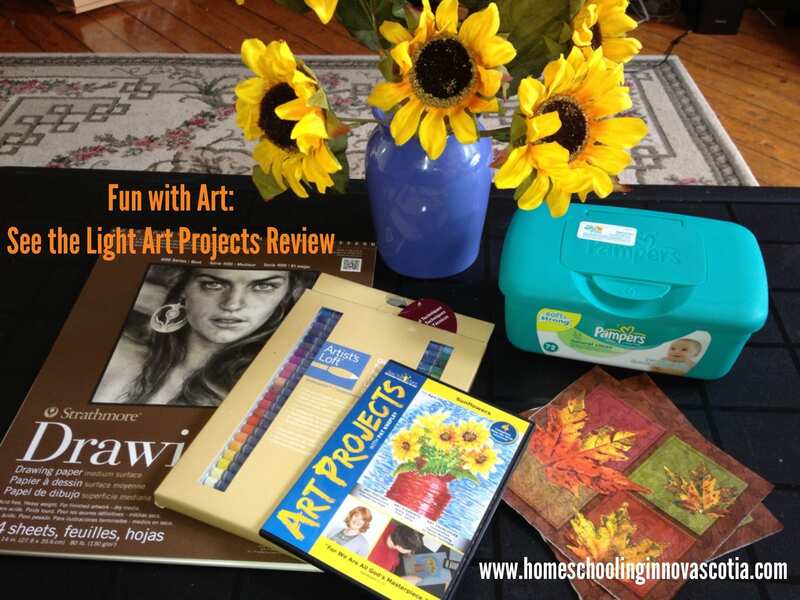 You may also like to check out my review of the Art Class DVDs. **I received this Art Project DVD in exchange for an honest review. All opinions are my own. Why wasn’t this book around when I went to university? This was the question I kept asking myself as I read Crush It At College! 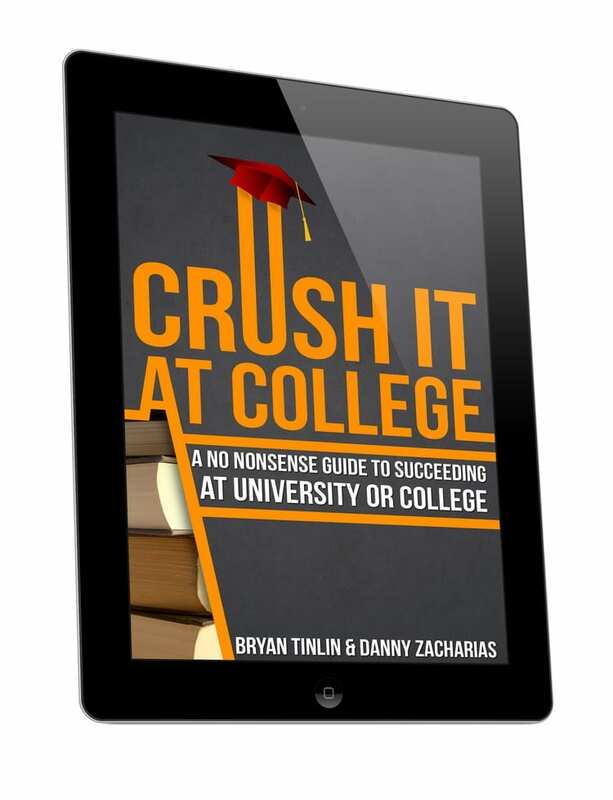 Crush It At College was written by two Nova Scotians, Tinlin Academic Advising and Consulting’s Bryan Tinlin, and Danny Zacharias, a lecturer at Acadia University. Collectively, they give useful, concise advice for everything from studying and scheduling, to homework and writing papers. I love their suggestions for helpful apps, software, and handy tools to enhance your productivity at college (I wish they existed 20 years ago, too)! 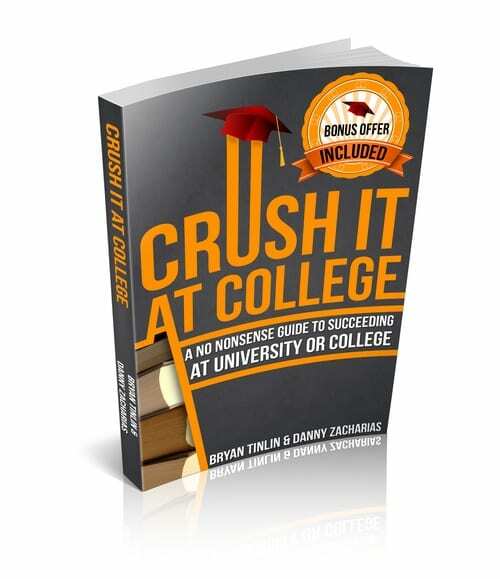 Crush It At College is a must-read for anyone heading to university or college. I have already gifted this wonderful book (Kindle version) to a young lady who was heading off to university this fall. I look forward to handing a copy to each of my children as they head off to university or college in the future! They won’t have to learn the “hard way”. What other hints or tips will you find inside? Chapter 5: The Low Down on Debt – How Far In The Hole Are You Willing To Go? Crush It At College is available in paperback for $9.99 and for Kindle/Kindle App for just $4.99. And check out the website for TAAC’s Advising Services and University 101, a Pre-university seminar. AND I’m very excited to announce that Crush It At College is FREE for Kindle/Kindle app now through September 25th! ** I received an e-book copy of Crush It At College in exchange for an honest review. All opinions are my own. Is your child or teen into computers? Do they want to give programming a try? 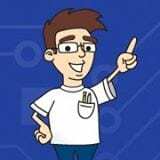 Homeschool Programming Inc. was founded in 2008 by homeschooling parents with degrees in Computer Science and Engineering. It offers computer programming curricula for children in Grades 4-12. I had the pleasure of receiving the Teen Coder Java Year Pack to work through with my 14 year old son. 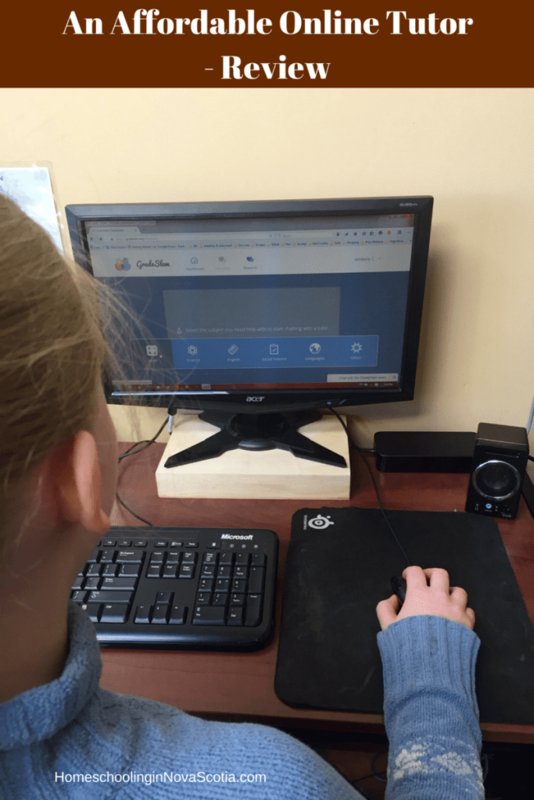 Homeschool Programming Inc. courses are designed for self-study, so the parent doesn’t have to know anything about programming – since I haven’t done any programming since way back in the days of Basic, this is a good thing! The Teen Coder Java Year Pack includes the one-semester Java Programming course AND the one-semester Android Programming course, which are compatible with Mac OS or Windows computers. My son was eager to start learning Java – he has been meaning to learn, since so many of his friends are into programming. He found it easy to follow the student book step by step and do the activities. The videos are handy and instructive, which my son appreciated. He didn’t need my help at all, and each lesson went quickly and easily, with no complaints. We will continue to work happily through the rest of the course and it will be his Computer Science credit for this, his Grade 10 year. Teen Coder courses are designed for Grades 9-12. 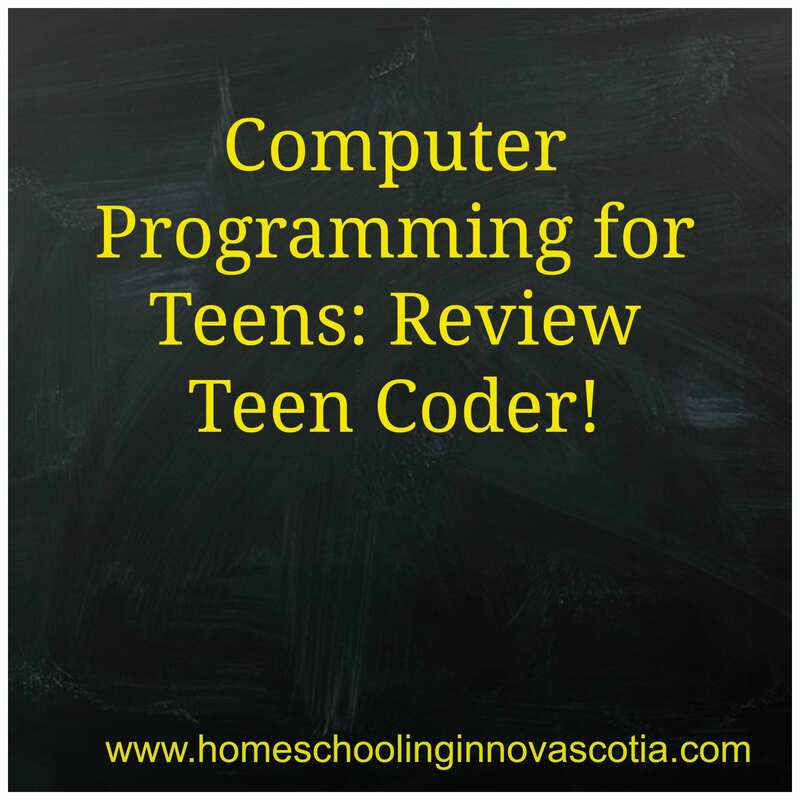 We found the Teen Coder program itself easy to install on our Windows 7 PC. The other programs needed for download, such as Java, were easy to install, using the step-by-step instructions provided in the Teen Coder instructions in the first chapters of the Student book. Each course includes student activity starters, supplementary instructional documents, a Solution Guide, fully coded solutions for all activities, optional tests and answer keys, guidance on evaluating projects, and free technical support is available. By the time your teen has completed this first-semester course, he/she will have finished programming a game in Java! Once your teen has completed this second-semester course, he/she will have finished programming an Android Game app! I can’t wait to see what my son will accomplish once he’s finished creating a Java game and an Android game app – I don’t think those will be the last games he creates. Learn more about the Java Programming course through this Teen Coder: Java Programming video, and more about the Android Programming course through this Teen Coder: Java Programming video. 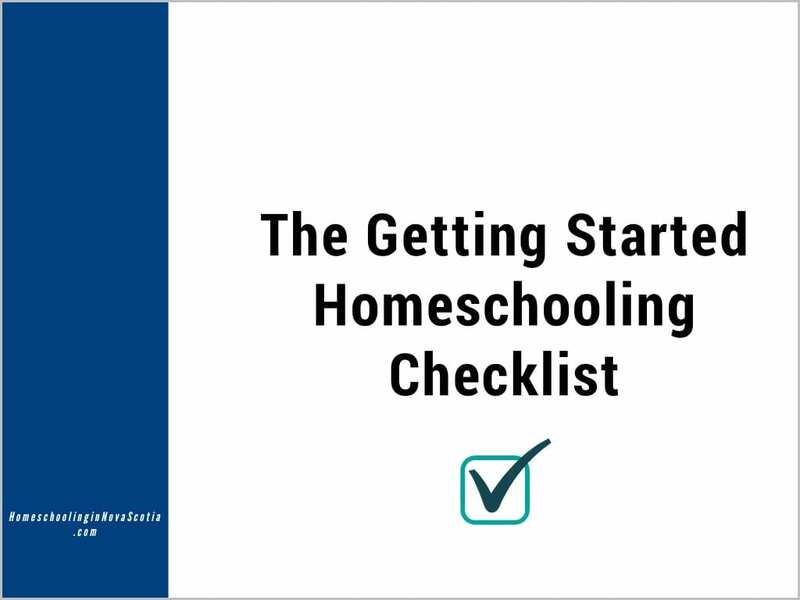 You can also find sample pages of all Homeschool Programming courses here. 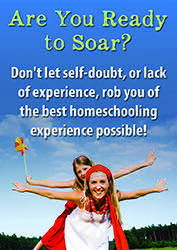 And feel free to visit the Homeschool Programming Facebook page. The Teen Coder Java Year Pack that I received includes the two courses (complete with Student Book) and videos (on DVD), for $155 US. You can also buy just the course (without the videos) for $130 US. And you may purchase the two programs separately – Java Programming and Android Programming are each $90 US for the course and videos, or $75 US for just the course. Please note that Android Programming is under construction and there will be a delay in shipping until it is complete. Check out all the Kid Coder and Teen Coder programs available here. Shipping is available throughout Canada, the U.S., and to select destinations worldwide. Go to the Mosaic Reviews Website to see what other Mosaic Reviews Team Members thought about the Kid Coder and Teen Coder programs.